Every year J and I take a trip down the coast and come back with kilos lemons from his parent's coast house. The trees are magical, they get very little love and attention but every year around August they become covered in lemons of all shapes and sizes so every year I have to come up with new ways to use lemons. So when I saw this recipe on Evan's Kitchen Ramblings I knew I had to make something similar. I couldn't make the exact recipe as I had the intention of making these for a celiac friend and, well, pastry is gluten central. Sure, I could have made gluten free pastry but I've tried that before and it was, to be completely honest, a disaster. I won't doubt that the issue was me but I wasn't game enough to try again. Instead I opted for a macaroon base which was perfect as it was extremely simple and an excellent way to use up the egg whites I had stashed in my freezer. As the base is macaroon it is extremely coconut-y tasting if you don't like coconut this isn't for you. However I would definitely recommend making the filling and using it in something else as it's seriously good. Preheat oven to 140°C (280°F). Grease and line the bases of 8 10 tart tins. Combine the egg whites, sugar, and coconut in a large bowl. Once thoroughly mixed divide evenly between the tart dishes. Press mixture firmly over the base and up the sides, using the back of a spoon if necessary. 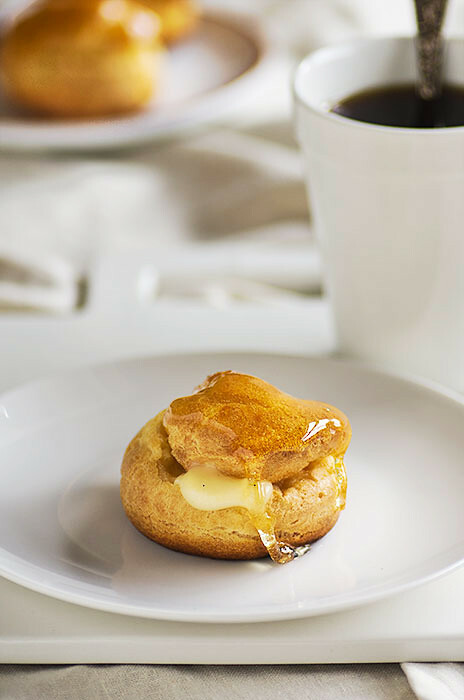 Bake for 25-30 minutes or until macaroon shells are firm and lightly golden. Cool then remove from the tins. Place a saucepan of water of heat and bring it to a simmer. 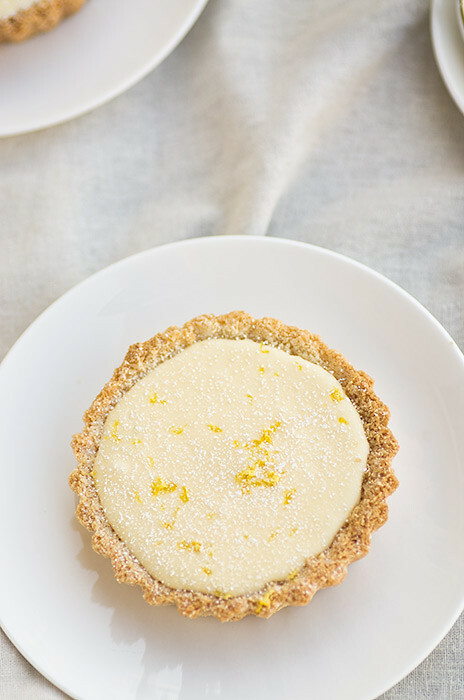 Combine the sugar and lemon zest in a heatproof bowl. Rub the sugar and zest together with your fingers until fragrant. Whisk in the eggs and lemon juice. Place the bowl over the saucepan of simmering water. Cook, whisking gently, until the cream thickens and reaches 82°C (180°F). You will see the cream turn from light and foamy in the beginning to thick and smooth as it nears the correct temperature. When the whisk starts to leave tracks the cream is nearly finished. Be patient, it could take as long as 10 minutes for the mixture to cook. As soon as the cream reaches the correct temperature, remove it from the heat and strain it into a blender or food processor. Cool the cream to 60°C (140°F), or for about 10 minutes. Working with the blender or food processor on high speed, add the pieces of butter about 5 at a time. Blend until combined, scraping down as required. Continue until all the pieces of butter are combined, then blend on high speed for another 3-4 minutes to ensure the cream is perfectly smooth. Spoon the lemon cream into the cooled coconut shell. Transfer to the refrigerator for 2-3 hours or until set. I am utterly in love with spiced biscuits and breads. They're so warming when it's awful and cold outside. They remind me that winter isn't so bad and summer is just around the corner. These gingerbread where supposed to be rolled with a patterned rolling pin but, I don't know about you, but I'm just not fancy enough to own one. So, instead I just cut them into boring circles and flicked the glaze over the top. They're not nearly as pretty as they would be if they had a cute pattern all over them but you can't have everything. This recipe is probably my new favourite. They're quite spicy and very clove-y. Which is fine, if you like cloves. If you don't, I'd use a bit less than the recipe suggests or leave the cloves out altogether. If you're after a more subtle spiced taste these are not what you're after. 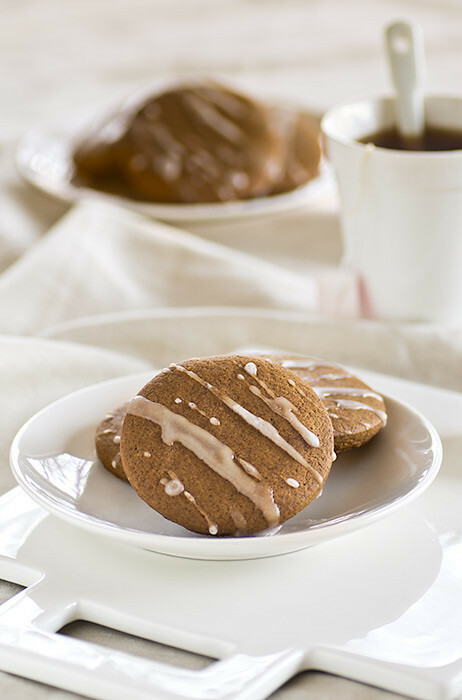 if you're after warming winter-y gingerbread this recipe hits the nail on the head. I also swapped out some of the treacle for golden syrup, as treacle is a bit too strong for me in such large quantities. I'm sure these biscuits are great either away. I'm glad I finally moved this recipe off my "to make" list and on to the "to make again" list. To make the dough, sift the flour, cocoa powder, cinnamon, baking soda, salt, and pepper into a mixing bowl and set aside. 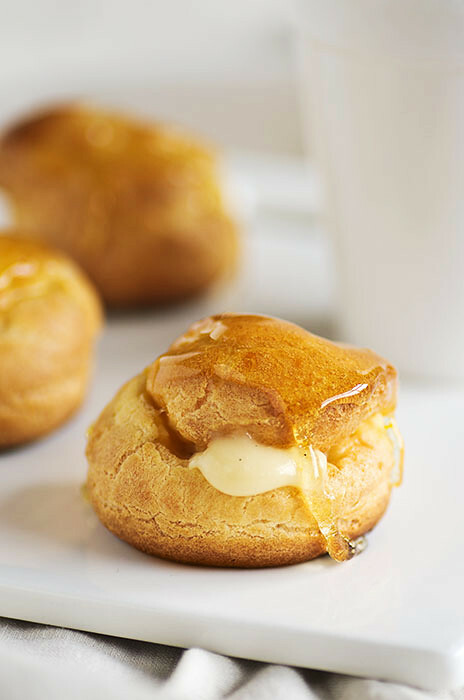 Using a stand mixer fitted with the paddle attachment, beat the butter on medium-high until smooth and creamy, about 3 minutes. Gradually add the sugars and continue to mix on high until the mixture is smooth and soft, about 5 minutes. Stop the mixer and scrape down the bowl if required. Add the egg and beat on low until combined. Add the molasses, golden syrup, and corn syrup and beat until incorporated. Stop the mixer and scrape down the sides of the bowl. Add the sifted flour mixture and beat on low until the mixture forms a dough that pulls away from the sides of the bowl and all the ingredients are thoroughly incorporated. Turn the dough out on to a piece of plastic wrap; flatten it into a rectangle about 2.5cm (1 inch) thick. Cover tightly and refrigerate overnight. When you are ready to bake the gingerbread, preheat the oven to 180°C (350°F). Line a tray with baking paper or a non-stick liner. Roll the dough out to be about 1.5cm (2/3 inch) thick. Using cutters, cut the dough into the desired shapes. Transfer the shapes to the baking tray, spacing them about 2.5cm (1 inch) apart. You may need to make multiple trays, if so - store the trays in the fridge until required. Bake the biscuits until they are golden around the outside but still soft to touch on in the centre, about 10 minutes. While the biscuits are baking, prepare the glaze. In a small bowl, whisk together the icing sugar, lemon juice, and water until smooth. When the biscuits are baked, remove them from the oven and cool on the tray for about 5 minutes. Then, while the biscuits are still warm, flick the glaze over the top and transfer them to a wire rack to cool completely. Store in a sealed container for up to two weeks. Unfortunately, for this post I only have part of the recipe to offer up. It's also the least featured part in the pictures. That's right, it's the biscotti recipe. The bisoctti that you can see only a tiny portion of on the right handside of the above picture. Opps. You see, I lost the cheesecake recipe. Which is kind of upsetting because it was pretty delicious. I'm a big fan of unbaked cheesecake so if anyone can recommend a recipe that'd be great as I don't have one anymore. On the plus side, these biscotti are pretty delcious. They smell of three varieties of citrus, yum! In them there's orange, lemon, and lime. It's quite lovely. They also have walnuts, I have a soft spot for so to me they're a combination of all good things. 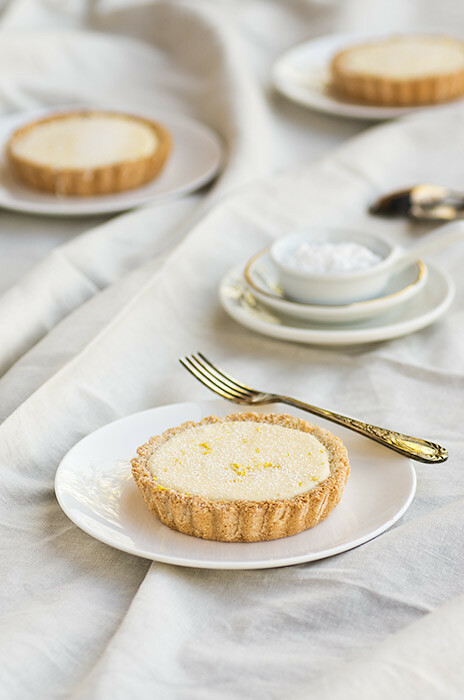 I used them instead of store bought biscuits for the base of these mini cheesecakes. 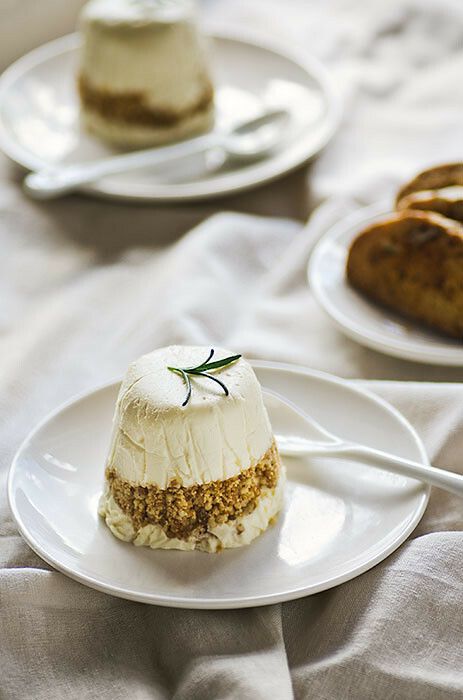 I totally recommend you should do the same next time you make cheesecakes, that is if you happen to have uneaten biscotti lying around the house. Which you probably don't because who can resist tasty, tasty biscotti? Place the flour, sugar, cloves, baking powder, grated citrus zests, and fennel seeds in a large mixing bowl and make a well in the centre. In a separate bowl, beat the whole eggs and yolks together. Pour the beaten egg mixture into the well in the centre of the dry ingredients and mix together to form a sticky dough. Add extra flour until you are able shape the dough, I found I needed to add a lot more flour than the recipe called for. Add the walnuts and mix to combine. Turn the dough out on to a floured surface. Sprinkle a little flour on the top and roll the dough into a sausage about 30cm long. Transfer the dough to the lined baking tray, sticking any cracks back together. Bake for 25-30 minutes, or until the dough is golden brown and set. Remove the log from the oven and allow to cool for 15 minutes. Transfer the log to a chopping board and, with a serrated knife, cut the biscotti into 1.5cm slices. Put the slices back on to the baking tray and return them to the oven. Reduce the oven temperature to 130°C and bake the slices for 15-20 minutes. Remove the biscotti from the oven and transfer them to a wire rack to cool. Typically I like my muffins light and fluffy with a crispy top, but there are times when I crave something dense and packed with delicious. Something that feels wicked in a way a light muffin never could. I think for those times I found the perfect recipe. The recipe for these muffins was originally meant for a loaf tin, but mid-way through making I realised I didn't actually own a loaf tin. I know most people check these things before they start a recipe but, hey, I thought I owned one and the recipe calls for 10 minutes of beating so I figured I could grease and line the pan then. Not owning a loaf pan didn't strike me as a big deal, I figured I could just make muffins instead... Then I realised I don't own a muffin pan either. Seriously, what kind of kitchen do I have? Fortunately, I do own a lot of dariole tins so I figured they would do, unfortunately they don't fit any of my cute muffin papers. 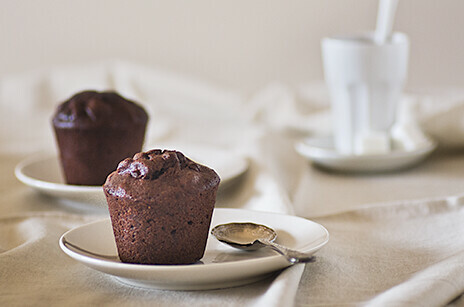 Muffins without cute papers wrapping their bases taste the same but they're nowhere near as cute. So I vowed to buy a muffin tin, which I haven't done yet and probably won't do. Not one to be deterred by a lack of appropriate equipment I decided to pucker on and boy was it worth it. These are chocolate and nut central. Yum yum. If you do own the right equipment you can of course make this in a load pan. According to the recipe you'll need a 22cm x 12 cm (9" x 5") loaf pan and you'll need to bake the load for 60-70 minutes rather than 30-40. Centre an oven rack and preheat the oven to 180°C (250°F). Grease or line 12 standard muffin cups. Sift together the flour, cocoa powder, and baking powder. Put the sugar and almond paste in a mixer fitted with the paddle attachment and beat on medium speed until the almond paste breaks up and mixes with the sugar; it would resemble damp sand. Add the eggs one at a time, beating for about 2 minutes after each addition. Replace the paddle attachment the paddle with the whisk attachment, increase the speed to high, and beat for 8-10 minutes, until the ingredients have formed an emulsion - the batter should resemble mayonnaise and the whisk will leave tracks. Reduce the mixer speed to low and add the milk, mix until combine, and then add the dry ingredients. Continue mixing until everything is combined. Working with a rubber spatula, fold in almonds, followed by the pecans, walnuts, and chocolate. Lastly, gently fold in the melted butter. Spoon the batter into the prepared muffin tin. Bake for 30-40 minutes, or until a skewer inserted into the middle comes out clean. 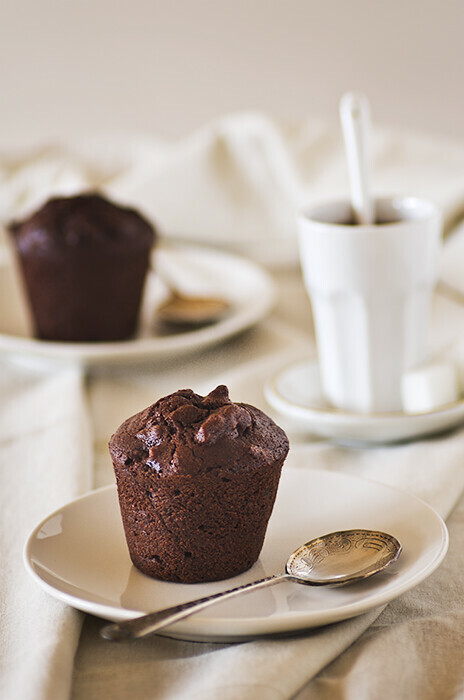 Remove the muffins from the oven and let the cakes cool in the tin for 10 minutes before unmolding. Remove the muffins from the tins and cool to room temperature. The muffins can be served the same day, or wrapped in plastic wrap and allowed to 'ripen' for a day before serving.